Be warned this post isn't so much of a recipe but me rambling on about how to cook a lump of beef. That lump of beef in particular is the Picanha or Rump Cap, the most prized cut of beef in Brazil. I first had picanha in a rodizio restaurant in Liverpool and not being a massive fan of rump I was surprised at how flavoursome it was. Rump steak is fine but because it's quite lean it usually lacks moisture and if not cooked rare/medium rare tends to be quite dry compared to a rib-eye or sirloin. 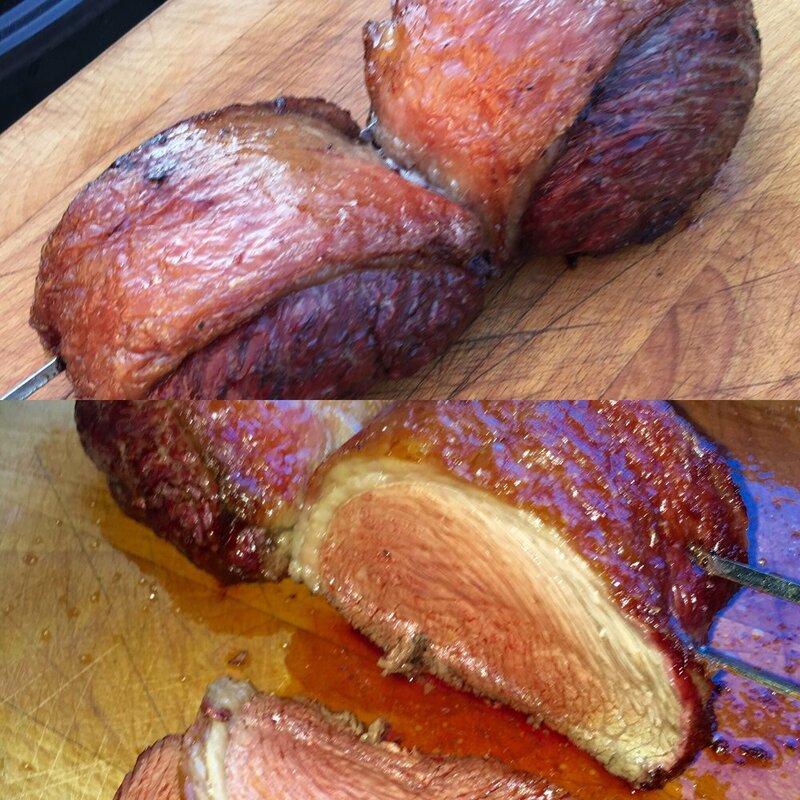 The rump cap isn't a cut that many people know about but compared to topside or silverside the picanha is in a different league. As you can see from the price below it is also an extremely cheap cut costing a mere £7.50 per KG, compare that to a rib roast and it is more than half the price. I purchased a cut that cost £11.33 that would probably feed 7-8 people comfortably. So I wanted to try and replicate how the meat is presented in a typical Rodizio were it is cooked over charcoal on skewers. As ever I purchased the beef from the Meat Merchant in Moira, a place were I spend too much time. Plus it is the only butchers that I have found that displays this cut without having to pre-order and describe what you are looking for. I wanted to try and replicate not only the method of cooking from a rodizio but also the look of the steak so I trimmed the beef to about three inches wide and four inches long, placed on a couple of skewers and seasoned heavily with pink salt. I then placed directly on the coals searing all sides (apart from the top fatty side which would cause the charcoal to flare up and burn the fat). Once seared set up the Weber for indirect cooking by placing the coals on either side of the meat then close the lid and cook for 20 minutes at 200c. During cooking the fat cap will baste the meat keeping it moist while also providing an excellent buttery flavour. After 20 mins remove the lid and check how it is progressing. Mine needed another 10 minutes to get to medium rare but as ever I recommend using a meat thermometer where you are looking for around 61c-63c (for medium rare). Remember to let the meat rest for at least 10 minutes before carving. For my first time cooking this particular cut of beef I was happy with how it turned out and as with all of my recipes it was fairly simple to do. So if your looking for a thrifty cut of beef that packs big flavour forget the topside next time and ask your butcher for a rump cap or picanha.